Contemporary one bedroom apartment with superb views of the River Derwent, situated 2.5 km (about 3 minutes by car) from Wrest Point Casino and only 4.5 km (about 6 mins) from Salamanca Place on Hobart's waterfront. With a queen-size bed, much of the furniture, including the dining table, bed head and bedside tables, has been custom made for the apartment by a local craftsman from blackheart sassafras, a beautiful Tasmanian minor species timber. The living area has large picture windows from which you can see waves breaking on the beach only 100 metres away, watch the yachts on the river or look upstream to the Hobart docks. The kitchen is set up for self catering and has a multi function oven, ceramic cook top and under bench refrigerator. It is well appointed with crockery, glassware and kitchen utensils. 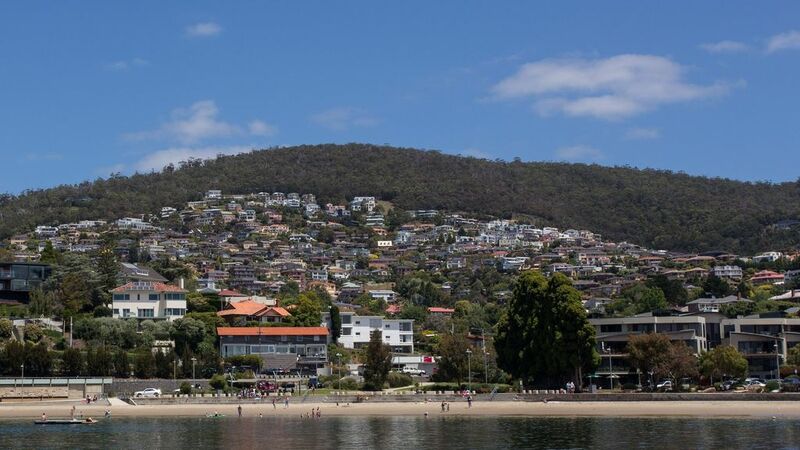 The apartment overlooks Hobart's premier waterfront recreation area with beach, foreshore walking paths, parklands and public sports grounds within a few minutes walk. The attactive foreshore is perfect for a morning jog or an evening stroll and beach-side meal at one of the restaurants or the free electric bbqs. The nearby shopping village has a supermarket, pharmacy, butcher shop, bottle shop, newsagency, hairdresser, cafes, restaurants, wood-fired pizzeria, doctors rooms and other services all within a few minutes walk. The bus to the city is only a minute's walk should you not wish to take a car. Kingston Beach Golf Club is only 10 km south and about 13 minutes pleasant drive. We also have a similar one bedroom apartment right next door which is available for bookings. If you are looking for accommodation for two couples, or if your dates are not available at Carolina please contact us. Views from th living room of Sandy Bay Beach which is only two minutes walk from your door. Most impressed with the property - interior very tasteful and very clean. Every item is tasteful and of high quality. The original and signed painting and photo makes the stay more special. Quaint little apartment near the sea. Michael and Anne the hosts were really wonderful. Quick to respond and always offered answers and alternatives to our questions. At first glance the apartment looks dated from the outside. But inside it is very modern and clean. Theres fresh carpet a small living space with a great TV. The bedroom has a really conformable bed and great fresh Sheridan linen and towels were provided. It is literally a 2 min walk to the Sandy Bay beach which has a lovely harbour walk we did daily. A huge window in the living space gives you an uninterrupted view of the harbour. About a 7 min drive to the heart of Hobart. Very reasonably priced. We would definitely go back again. My husband and I recently spent 4 nights at the Carolina apartment. Our first impression was that the building is in need of a coat of paint on the outside and the parking space is only suitable for a very small car. However the interior of the apartment is very comfortable, with a very good bed and good quality bed linen. It is a small apartment but has everything that is needed including a stove top coffee maker which I really appreciated. We had a wine bottle with a cork and there was no corkscrew but the bottle shop is nearby so this problem was easily rectified. Probably the most outstanding quality of the apartment is the great view of the river. There is a large window which overlooks the river and as Hobart is very hilly when inside the apartment the impression is that you are elevated looking out over an expansive view. The apartment has lots of thoughtful extras such as books and DVDs which we didn't use but they were available. There is a very nice park nearby and we were able to go on some nice walks. We had a hire car but one evening we caught the bus into town which is right out the front and very convenient. Sandy Bay is the most lovely area of Hobart. The owners were also very kind and allowed us to check in a little earlier as we arrived on an early morning flight. I would certainly recommend this property. Unassuming from the outside, this lovely one-bedroom unit is a great place to stay in Hobart. There are lots of great touches - from the rainbow umbrella to the picnic basket, that make this unit a cut above. Public transport almost at the front door make it very convenient and there are peaceful water views from the living area. A fresh coat of paint, a comfy bed with crisp white linen and a cosy sofa up the comfort levels. The owners were responsive prior to check in and I had no need to contact them during the stay. Overall very happy with my stay. Thank you Michael and Anne. Newly refurbished -tastefully done - excellent views of the bay. Thank you Janice; we’re really glad you enjoyed your stay. And thank you for being a very gracious guest. A lovely and well designed apartment with great views of the Derwent river. Most comfortable bed and all furnishings were to a very high standard. Overall a great stay at this apartment.